With considerable zeal, Margaret sought to change what she considered to be old-fashioned and careless practices among the Scottish clergy. She insisted that the observance of Lent, for example, was to begin on Ash Wednesday, rather than on the following Monday, and that the Mass should be celebrated according to the accepted Roman rite of the Church, and not in barbarous form and language. The Lord’s Day was to be a day when, she said, “we apply ourselves only to prayers.” She argued vigorously, though not always with success, against the exaggerated sense of unworthiness that made many of the pious Scots unwilling to receive Communion regularly. Margaret’s energies were not limited to reformation of formal Church practices. She encouraged the founding of schools, hospitals, and orphanages, and used her influence with King Malcolm to help her improve the quality of life among the isolated Scottish clans. Together, Margaret and her husband rebuilt the monastery of Iona and founded Dunfermline Abby, under the direction on Benedictine monks. In addition to her zeal for Church and people, Margaret was a conscientious wife and the mother of eight children. Malcolm, a strong-willed man, came to trust her judgement even in matters of State. She saw also to the spiritual welfare of her large household, providing servants with opportunity for regular worship and prayer. I. O God, who didst call thy servant Margaret to an earthly throne that might advance thy heavenly kingdom, and didst give her zeal for thy Church and love for they people: Mercifully grant that we who commemorate her this day may be fruitful in good works, and attain to the glorious crown of thy saints; through Jesus Christ our Lord, who liveth and reigneth with thee and the Holy Spirit, one God, for ever and ever. Amen. II. O God, you called your servant Margaret to an earthly throne that she might advance your heavenly kingdom, and gave her zeal for your Church and love for your people: Mercifully grant that we who commemorate her this day may be fruitful in good works, and attain to the glorious crown of your saints; through Jesus Christ our Lord, who lives and reigns with you and the Holy Spirit, one God for ever and ever. Amen. Readings: They are all about giving to the poor and seem good choices. Line 3 of the third paragraph: delete the redundant second “her” in this line. Line 4 of the fifth paragraph: capitalize “Highland”. Line 5 of the fifth paragraph: was this return to “isolation” really brief? Since this is a bio of St. Margaret, it doesn’t really matter here. I would omit it without clear evidence that it really was “brief’. Certainly, there was a hostility a hundred or so years later. Thanks, NIgel–that was informative, clear, precise, and very interesting. Having just run-out (by agreement) the homeless sleeping in the chapel, I couldn’t help but feel the irony of then recognizing this person who seemed so sensitive to the needs of others. As a person of mostly Scot background whose family had maintained ties with home it is a bit insulting even today as I am sure it was then to be told your traditions, custom and language is barbarous and the “latin” is not. They could work up a good inquisition or crusade or witch-hunt if so inclined at the moment. I might leave the barbarous part out. For sometimes it was not easy to see who was the true “barbarian.” Although rigid and intolerant perhaps she did have a sense of duty to all her people. A good choice over all. The readings fit well as did the collect. Her bio. needs some more work IMHO. The impression I have of Margaret from the write-up today is a collage of miscellaneous impressions, rather than a linear story of her life and faithful works, and as such the collage has integrity of its own. One piece I don’t find included is an opening that tells of her origins, development, or at least tells of her becoming Queen of Scotland. For whatever reason, the Shakespeare opening strikes me as too oblique. 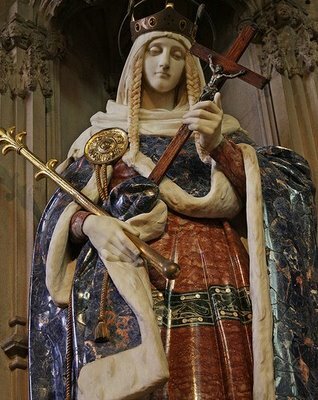 The sentence from paragraph 5, “her work among the people and her reforms in the Church made her Scotland’s most beloved saint,” would serve well as part of her introduction. The sentence beginning, “she died” is perfect as the concluding sentence. Being more of a collage than a flow chart, I’m not sure it makes sense for me to go further, but in the spirit of “fools rush in where angels ain’t so blithering stupid,” I will stick my neck out – ever so hesitantly, with great reluctance and due apology. Then Paragraph 2, although as an observation, I don’t see the items mentioned (when Lent began, which Eucharistic rite to use, etc.) as illustrating “old fashioned and careless [clergy] practices” so much as being rather matters of liturgical and devotional reform. She died on November 16, and was buried at Dunfermline Abbey. I. O God, who didst call thy servant Margaret to an earthly throne that [she] might advance thy heavenly kingdom, and didst give her zeal for thy Church and love for [thy] people: Mercifully … (etc.). Nice editing work. I concur.